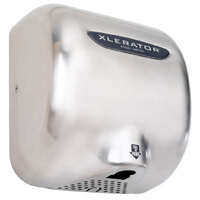 Retirement Daze: Does hand drying cause ear damage? Rant on, because this is interesting!! I don't ever use the dryers! I have perfected a way to get in and out of public restrooms without touching anything!! NOTHING! I watched a whole Oprah show some time ago about the germs there, and that did it for me! and by the way, don't ever sit your purse down on the floor in the stall. I don't use those things. I just don't! If that is my only choice, I shake my hands and wave them around, then I dry the remainder on the legs of my jeans! Seriously, they irritate me with the sound, and they make my hands seem drier (in an "I need hand lotion" way) than paper towels. People look at me funny when I bend over and pat my hands against my shins, but I am old enough to not care! Eccentric is not a bad thing. Is it? OK, you have convinced me. Jeans or shaking my hands it is. So, if you see me flapping my hands, I'm just air drying. But if you see me flailing myself around the head and ears, flapping wildly, I have either gone completely around the bend or I have run into a cloud of Mississippi gnats, those insects that are barely visible and are all teeth. I think they are called no-see-ums in other coastal regions. Oops! i guess that is another mini-rant! I have run into one of those. I didn't notice the sound as much as I did the skin on my hands actually being blown about. Scary. The ones I loathe are those where you have to "disappear" your hands down into the bowels of the machine - Yeuch! The pants have it hands down! I don't think the air dryers actually work very good. Noisy and make me feel like I need hand lotion afterwards. Your ending thought about the no-see-ums is funny but true. Flail away!